The Eagle's Nest, The Midas Touch, House of Cards, Last of the Cybernauts...?, To Catch a Rat, Cat Amongst the Pigeons, Target!, Faces, The Tale of the Big Why, Three Handed Game, Sleeper, Gnaws, Dirtier by the Dozen, Hostage, Trap, Dead Men are Dangerous, Medium Rare, Angels of Death, Obsession (aka Missile), The Lion and the Unicorn, K is For Kill [part one: The Tiger Awakes (aka The Long Sleep)] & [part two: Tiger by the Tail], Complex, The Gladiators, Forward Base, Emily. Links to most of the following are to www.imdb.com The Internet Movie Database. Stunt double for Diana Rigg: Cyd Child. Story Editors: Bob Dearberg (two of the last four episodes). 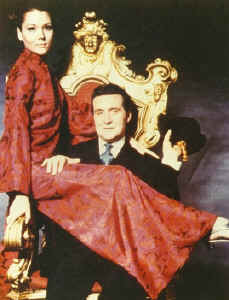 The Avengers was broadcast to over 120 countries, under various titles. South Korea: 전격 제로 작전 (The Blitzkrieg Operation No. 0) for "The New Avengers"
Taiwan: 復仇者 (The Avengers). From October 1969 to 1972 Emma Peel-era episode aired Tuesday evenings, 10-11 P.M.